In celebration and support of PinkDot 2019, we are proud to present Strength in Diversity – Barbell Fundamentals for Beginners workshop. Have you been wanting to get stronger but do not know where to start? Or perhaps the avenues that you have explored so far seem hostile and daunting. Our mission is to create a safe, welcoming, inclusive and uplifting platform and build a diverse community committed to getting stronger together. We welcome everyone – LGBT+, straight, young, old, tall, short…you get the idea. Come join us at this 3-hour workshop to start your journey in getting stronger through the BIG 3 – Squat, Bench and Deadlift. We will go through the fundamentals of each lift. Intermediate lifters who want to fine tune their technique are welcome too. *All proceeds will be donated to PinkDot. 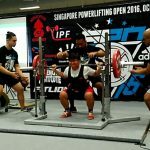 For those in the LGBT+ community who are looking to make strength sport a long-term endeavour, perhaps we could even work towards forming a Singapore contingent and competing in Powerlifting in the 11th Gay Games Hong Kong 2022! If you have any questions regarding this event, feel free to contact us here or call us at 96910204. Otherwise, click on the “Add to Cart” below to start your registration process!